Waldorf are a company with a patchy history. They have released unfinished products — most notably the Wave and the Q — and they even went bankrupt in 2004 only to reappear two years later with much the same product line as before. But they nevertheless retain a reputation for designing interesting products and, while recent developments have tended to be smaller and lower cost, the company are now aiming high again. I must admit to having had some trepidation when I agreed to review the Quantum. Would it fulfil its promise, or would it shower me with 'this feature is not yet implemented' messages as one Waldorf flagship did in the past? Let's find out. 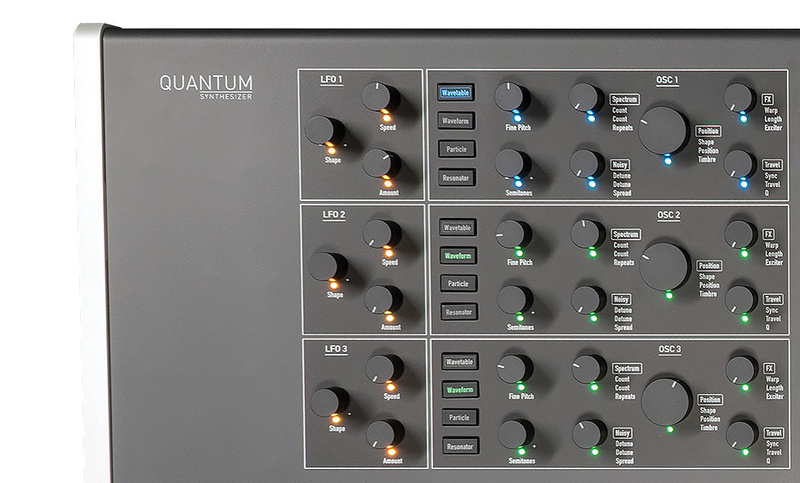 Although the Quantum appears to be a conventional eight-voice analogue/digital hybrid polysynth I can almost guarantee that you'll fail to get the best from it if you plunge in without researching its capabilities. It's not that it's arcane, but there's a great deal going on within it and the 'I never read manuals, it shrinks my testicles' brigade is going to suffer in comparison with players who take the time to understand it. But don't fret about this. Once I had learned the Quantum, I found it to be quick and straightforward to use. But why the concern? After all, the control panel reveals that it's just a three-oscillator-per-voice polysynth with a couple of filter sections, three LFOs, three contour generators, something called a 'Komplex Modulator', and three effects sections, right? Wrong. Very wrong. Each of the three oscillators can host your choice from four sound generation methods and, depending upon the method chosen, all of the LEDs associated with its knobs will light up in a different colour — cyan to denote a wavetable oscillator, green for a waveform (virtual analogue) oscillator, and so on. 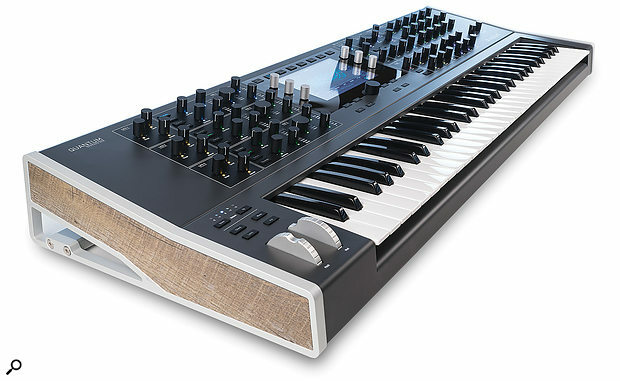 You can control seven of the most useful parameters for each oscillator type using the large, friendly knobs on the front panel, while many more are accessible from the large touch-sensitive screen. And, to ice the cake, you can even save and recall individual oscillator setups. Perhaps because of Waldorf's long-standing relationship with wavetable synthesis, this is the first oscillator type offered. The Quantum includes 85 factory wavetables, and these are real, 128-stage wavetables that you can travel through in meaningful ways. You can select the table used, its pitch, key tracking and pan, the position and brightness of its spectral envelope, the amount of noise applied to the steps in the table, and whether any drive or gain is applied. You can also determine how you move through the table, how quickly, and whether the steps are interpolated for smooth timbral changes or stepped with various quantisations for grainy transitions. In addition to using things such as LFOs and contour generators to sweep through the table you can use MIDI note numbers to determine the playback position as well as the resulting sound's noise level and brilliance, so each key can have a different but related timbre from the next. You can also create your own wavetables, either by typing a phrase into the Quantum for text-to-speech-to-wavetable conversion, or by analysing an audio file held in its flash memory. The results can then be saved to the internal memory or to an SD card. (Unfortunately, it doesn't seem possible to give your own wavetables meaningful names, and any that you generate are just called User X, where 'X' is a number, which is going to be a problem once you've created a large library of them.) If you like the glassy, sometimes fragile sounds of the type pioneered by the earliest PPGs, or the evolving sounds at which wavetable synthesis can excel, you'll love this oscillator type. The next is called Waveform, and this generates the classic analogue waves — sine, triangle, sawtooth and square, with additional white and pink noise options. A Warp function then shapes these into intermediate waveforms and adds things such as pulse-width modulation. However, its apparent simplicity hides several advanced features. One of these is Sync. Nothing special here you might think, but there is; the sync oscillator isn't one of the other oscillators, it's part of the oscillator that you're programming. Taking this concept even further, each oscillator offers up to eight 'kernels' that share the same waveform but can have independent pitches for kernels 1 to 4 (which are duplicated for kernels 5 to 8 if used) and independent positions in a stereo spread. To test this type, I started with a single oscillator and used it as the basis of a simple eight-voice, single-oscillator-per-voice polysynth. This placed me firmly in Juno‑60 territory. Sure, the sound wasn't the same, but experimentation yielded sounds that I would have been happy to substitute for a Juno. Adding the second and third oscillators and selecting appropriate filter types (which we'll come to presently) took me into the realms occupied by Prophets, Oberheims, Jupiters and the Memorymoog. Even with its unusual PitchVar (pitch variation) parameter, the Quantum didn't ever sound quite like any of those synthesizers, but this isn't a criticism; I programmed many two- and three-oscillator-per-voice patches that I would have been proud to use, and one would have to be an analogue fanatic to deny their quality or musicality. Furthermore, in its monophonic mode, the Quantum also makes a fine virtual analogue monosynth.